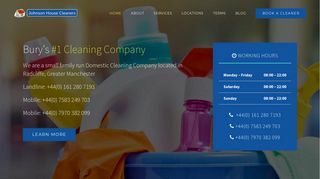 A domestic cleaning company based out of Radcliffe, Manchester. A small family run company that specialises in all aspects of home cleaning, including regular and one off cleaning, spring cleaning, laundry and ironing services, and also end of tenancy cleaning in Manchester. They’re a very reliable cleaning company I have use them before in my old house, good company.